Welcome to PART 3 of my HOW TO SING PAST YOUR BREAK series. In this video we'll talk about how to mix chest and head voice and how you should go about doing this. PART 1 - The difference between head voice, falsetto, mixed voice and chest voice. PART 2 - Why your CHEST voice is the secret to learning how to sing past your vocal break. In Part 2 I mentioned how there IS a time and place for bridging from your chest voice into your falsetto smoothly. I say falsetto because most people when they talk about crossing from chest to head voice are REALLY talking about a non-breathy falsetto. I talk more about this in part 1. Check it out. HOW TO GET RID OF VOCAL BREAK - PART 2 - STAY IN CHEST VOICE BUT REFINE IT! I showed you the proof that myself and my students can sing through the vocal break. I demonstrated falsetto, 2 different types of head voice, chest voice, mixed voice and explain how they all fit together in the puzzle of the vocal break. If you haven't seen PART 1 of how to sing past your break, then check that out first here. Now that we’ve gotten the terminology out of the way, in today’s video I’m going to show you the actual process on how to get rid of the vocal break. How exactly is it done? What sorts of sounds will you need to do? That’s what we’re going to talk about today. HOW TO SING PAST YOUR BREAK - PART 1 - Head Voice vs Falsetto vs Mixed Voice vs Chest Voice? Stuck on how to sing past your break? 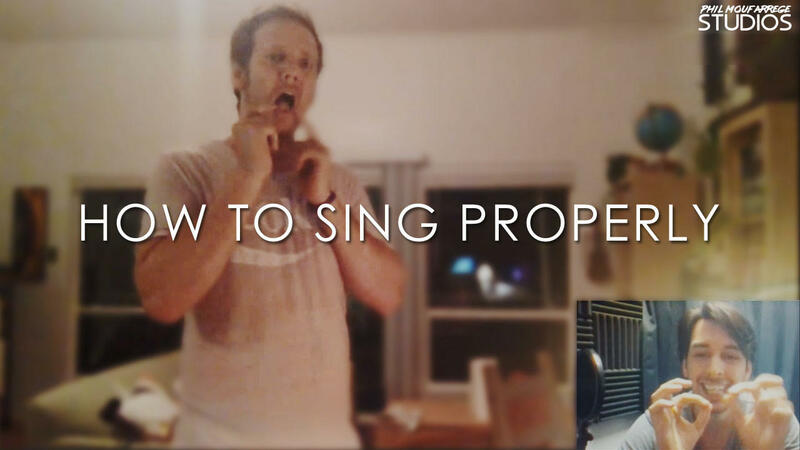 Feel like you’ve tried every vocal exercise without any luck? You’re in the right place. I was stuck on this for YEARS not knowing what I was meant to do to overcome it. This is video is PART 1 of a new free video series I'm creating about how to sing past your break in full voice. Check out Part 2 and Part 3 here. I prove to you that I can sing through my vocal break as well as my students. I demonstrate falsetto, 2 different types of head voice, chest voice, mixed voice and explain how they all fit together in the puzzle of the vocal break. In PART 2 I'll be explaining the actual process of how you go about building your voice so that you can sing past your vocal break without cracking or flipping. I'm struggling with my mixed voice/head voice. I am very comfortable in a baritone/chest range but the music I love to sing and write sounds much better an octave up. I have gone through courses and can hit all the notes but my tone is inconsistent right around the chest/head transition. I don’t want there to be a distinct tonal difference, I want my “upper chest voice” and “lower head voice” to blend into one smooth voice. Right now my “lower head voice” is not rich at all. Q: "How would you make your mixed voice more Chestier? I already have a decent mix but I'd like to make it more Chestier. I'm doing it by lowering my larynx and opening up my mouth more but I'm not satisfied with my current level yet." So you can already sing in a mix but it's kind of light and lacks power or fullness. How do you get it fuller and more chesty? Before we get into that firstly let me just say that mixed voice is NOT about "mixing" your chest voice and head voice (non-breathy falsetto) together. It is not some "inbetween" voice. Mixed voice is simply your chest voice working the right way. Instead of straining, it just keeps going up. If you want to know more about that contact me anytime. Q: "I’m a musical theater singer and my current biggest challenge is mastering breath control. I know how to breathe properly for singing, but I can't seem to find exercises that improve my breath control. I’ve tried breathing in and breathing out on a hiss, but I don't know if it is helping." When it comes to breath control for singing the best way to improve it is through actual singing practice rather than breathing exercises such as the infamous "sustained sss". Breath control for singing is developed by learning how to pace where you give your energy on a phrase - which is why you need to practice this in singing. Just doing a sustained "sss" will not teach you how to use it in singing. The louder and higher you sing the more you will feel a "push" from the lower abdomen, the sides (love handles) in particular if you do it right. Q: "Hey Phil my problem is I can go through my Bridges, but when I hit my first bridge or beginning of the mix I get a rough tone ( Vocal fry and it crackles like crazy) I don't know if it's that I might have acid reflux, thyroid issues, or maybe allergies. I have been taking meds and no luck I am guilty of pulled up chest as well, and have trouble singing quietly. I don't feel like I'm thinking out the voice in the right way. Thanks"
So why is my voice so raspy when I sing? There are usually two reasons why your voice is raspy/crackly/distorted. It can sometimes be because of misuse/overworking the voice - I deal with this a lot in pro gigging and touring singers. However in THIS particular case today, from the singer who sent in the question, the problem is different.